Backing up your email is as important as backing up your documents and photos. But you can't back them up if you don't know where they are. 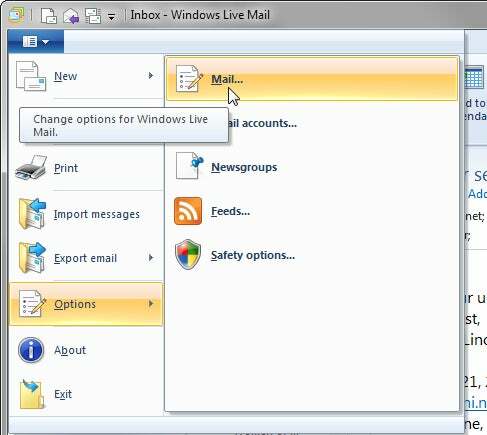 To find where Windows Live Mail stores your mail, you must first get to the program's Options dialog box. How do you get there? That depends on your version of Windows Live Mail. In Windows Live Mail 2011, click the dark blue tab to the upper-left corner. Select Options, then Mail. In earlier versions, and in the current XP version, press and release the ALT key to bring up the menus, and select Tools, then Options. Once you're in the dialog box, click the Advanced tab, then the Maintenance button. Click the Store Folder button. A little dialog box will come up with the path. If you're using Vista or Windows 7, that path is probably C:\Users\yourlogon\AppData\Local\Microsoft\Windows Live Mail, where yourlogon is the name you use to log onto Windows. Note that the AppData folder is hidden; you won't see it in Windows Explorer, although you can still get to it by typing the path. XP users will probably find the path at C:\Documents and Settings\yourlogon\Local Settings\Application Data\Microsoft\Windows Live Mail.